The following is a little blast from the past. I read somewhere that being a homemaker is like stringing beads and forgetting to knot the end. How true that can be. And being a mother is just about the same scenario. The laundry is never finished. Just when I empty the last basekt, the baby spits up. After the sink drains of warm, soapy water, I find a cup under the couch and have no idea what was drunk out of it…or when. The everyday chores are just that, every day! The kids are bathed and smell great until they eat their next meal. The fresh scent of baby powder is quickly replaced with dirty diaper odor. An entire box of cereal gets dumped within\ minutes of running the vacuum. When my husband comes home from work and innocently asks, “What did you do today?” I could cry. He can’t see what I’ve accomplished since none of the tasks stay done. I haven’t sat down all day and still don’t feel I can because things are not yet in order. Before I had children, I was a person who thrived on accomplishments and finishing tasks. At the office, when I finished a form and filed it away, there was a true sense of completion. With my new job, Motherhood, I haven’t had that feeling, and I know that my job as a mother is just beginning. Three and a half years into this new career I recognize that my need to complete a task is as important as ever. I feel so pleased with myself when I get to the last page of a book — even if it is a book on sibling rivalry. I now try to sit down and cross-stitch or write every day just so that I can see something I did was not undone in the same day. I realize that my personality requires that I take some time daily to accomplish something concrete. My job of nurturing my children and my daily tasks are important, but so is my sense of accomplishment. For now, I will try to complete something small for myself every day, while continuing to do all the other tasks of a homemaker and mother. Then, when my children are grown, and the knot is tied at the end of this string of beads, I will really know what it feels like to be rewarded with a completed project. I hope that it will be a project well done because I also took the time to care for myself. Linda J. Beck writes from her home in Chicora, Pennsylvania. She and her husband George are the parents of three children, Kevin (four-and-a-half), Lori (two) & Nicole (two months). Sobbing. Uncontrollable. Raging. Screaming. Senseless Words. Pain so deep you drown. Daily. I could say my son suffers from Reactive Attachment Disorder, but the truth is that the whole family does. He is triggered internally, some sort of flashback, some sort of feeling he is uncomfortable with and we all suffer. I don’t know what today’s trigger was. He spent the day with the Psychiatrist. They discussed all the progress he is making and decided to cut back on some medication. He and his Dad went out to eat and chatted about the Pittsburgh Pirates on the way home. He went downstairs to play some beloved video games and I asked him to burn the papers (we do that around here.) He opened the drawer to the matches and saw that I bought him a new lighter. He ran to me with hugs of thanksgiving and headed out. He completed his task and then headed to the chicken coop and decided to show the birds the flame. He didn’t really do anything, he just put the lighter inside the chicken wire and showed them. I caught him and yelled for him to stop. He stopped. And, it went all down hill from there. He and his Dad were screaming, his sister & he couldn’t be in the same room, he was sent to his room where his throaty screams echo throughout the whole house. He pounds the walls, pulls the wallpaper off the wall, throws things and screams to us about God. He texts his friends, threatens to call CYS & berates our efforts to help him figure this out. Reactive Attachment Disorder wins again. It has attacked the one who has attachment issues and it has poisoned the whole family for the evening. I won’t be going to church with my husband, my plans have changed, there’s no fixing this, there’s no consequences. There’s just pain and bitter disappointment for all. I’d love to say this doesn’t happen often. And, actually, yesterday we complimented him on it happening less frequently, but today it has happened. I’d like to say that I responded differently and to be honest, I have responded to the same situation differently before…about a gazillion times before. I’ve done everything the professionals tell me to. I’ve attended the workshops, I’ve been in therapy, I’ve read the books, I’ve responded appropriately, but today I reacted instead of responded. Maybe this approach will work. Doubtful. The hope that has gotten me this far is like sands in an hour glass and I’m about on my last grain of hope. Being Me, I will turn this all around. I know that. I know I will write about flipping the hour glass over and how I will recognize that God renews my hope just like the sands in the glass. How the sand will all be at the top and slowly trickle to the bottom again. God does renew me & I know He will again. But right now I’m just mad. I’m mad at unanswered prayer. I’m mad at the people who didn’t take care of him when he was a baby. I’m mad at the people who think they know what he is like. I’m mad at the agencies who don’t have a clue. I’m mad to know that I am one of many hurting parents trying to deal with this diagnosis. I’m mad at a child welfare system that keeps moving kids around and creates this disorder. But, mostly, I’m mad about missing church. Instead of church I’ll sit here and sob. I’ll ponder the situation and wonder what I’m to learn from this. I’ll cry out and ask why it has to be like this. I’ll realize that I will never know. Except for a few years in my twenties, I have lived in this small town my whole life. At times it has seemed a little too small but when choosing where to raise my family, I chose here. There are lots of reasons, but today one of them arrived to me in the mail. Our community holds Wednesday evening Lenten Worship services. This is a multi-denominational/multi-congregational service where we mix up congregations, buildings and pastors. I love these unique services where the Lutheran Pastor preaches from the Baptist pulpit to a congregation full of diversity. What a blessing to attend with other church go-ers who don’t necessarily go to your church. After this service, coffee and cookies are usually served with some socializing. It’s a nice midweek break on these winter evenings. Though we don’t always stay for the cookies, last week we did. I found a particular cookie that I really enjoyed and mentioned it to one of the ladies serving that evening. She said she didn’t know what the cookie was called or who baked it. I told her that if she ever met the baker, to let her know how much I enjoyed it. She smiled and said she would. Today amid the pile of junk and other mail that didn’t really interest me, I received a small envelope. Enclosed was a handwritten note (remember those?) and a copy of a recipe that looked like it was originally off of a mimeograph machine. “Linda, The cookies were made by Roberta. She copied the recipe for you and brought to church on Sunday. Enjoy! Donna” I sincerely appreciate a small town where its’ inhabitants take the time to copy a recipe and mail it to me….just because. Just to be neighborly. I guess it’s not necessarily the small town I love, it’s the people in it. 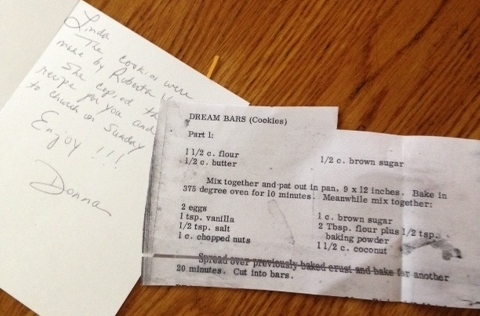 Now, off to buy the ingredients to make my own Dream Bars! Thank you Donna!! Mix together & pat out in pan. 9×12 inches. Bake in 375 degree oven for 10 minutes. Spread over previously baked crust and bake for another 20 minutes. Cut into bars. While packing up her back pack for school, she puts her sheet music from her private music teacher in her homework folder. When I asked her about it she explained that she often likes to sing at indoor recess. I highly doubted that she did, and said, “I don’t think that’s a good idea.” I assumed she would take the music out, throw it on her school desk and come home without it. I was right. She forgot the music at school so did not have a copy to take to her lesson that evening. I was justified in giving her an “I told you so,” but it didn’t help at lessons that night. The next day, she came downstairs wearing a too-tight pencil skirt& high heeled sandals. It was about 30 degrees out. Remembering to “pick my battles” I reasoned that her Dad was driving her to school that day and I always meet her at the bus stop after school, so really, she’d only be outside in the cold for a very short time. But, I did say, “I don’t think that’s a good idea.” She assured me she was comfortable and wanted to wear that favorite skirt one last time before passing it on. That day I was giving a talk at a Mothers of Preschoolers group on “Being Bravely You.” I explained that Mothering takes a lot of bravery. We have to be brave to let go and to let our children make their own choices as they get the opportunity to so that when they are older, we can be brave and watch them go. I even spoke about how brave we have to be to let our children choose small things and even how we have to bravely watch them fail sometimes. I mentioned Kaylee’s pencil skirt and high heels that morning and how I had to be brave to let her Dad drive off that very morning. Fast forward to Bus pick up time. My husband was spreading limestone on our mud filled driveway, so I wasn’t able to drive the car to the end of the lane. I walked out to meet the bus. The day had warmed some, but was still pretty chilly when she stepped off the bus. In her heels she wasn’t able to navigate over the large chunks of new limestone that now donned our lane. She was cold and wanted to hurry home, but couldn’t. Knowing I was partially to blame for her choices, I decided to carry her on my back, but with the tight pencil skirt, she was unable to straddle my back. I had to pick her up in my arms to carry her up the hill and out of sight of the cars driving by. When we were out of view, I hiked her skirt up to her waist (to her horror!) and made her climb on my back to make the trek the rest of the way to the house. We were quite a sight with her cold, bare legs dangling and my huffing and puffing as I ran. A few weeks ago, as I sat in the choir loft at church, I looked down at the two children who were listening to the children’s sermon. It was my eight year old daughter and her 18 month old cousin. They were sitting on the front pew and little Ella was listening as intently as I have ever seen her. Even the Pastor mentioned how she appeared to be taking it all in. When it was time for the prayer, my daughter put her arms around Ella and took her hands in her own to show her how to fold her hands in prayer. They were both dressed in black and white and it looked like they were posing for a picture to be used as an advertisement for a church or something. It was a perfect scene and I so wished I had had my camera to take a picture. I took a moment for prayer myself. I prayed that God would allow me to take a snapshot with my mind of that very moment so that I could always remember these two little girls, their innocence, their sincerity. I looked at them with intent and clicked a button in my mind. This wasn’t the first snapshot that I’ve taken without a camera in my hand. I remember another occasion where my older daughters were playing in the sandbox. They were probably 5 and 3 and they were just chattering and playing nicely. I remember looking at them through my kitchen window while doing lunch dishes and wanting to remember that moment forever. When would it ever be like this again? They were both wearing pink and they were smiling and giggling as they dug. I took the picture for my memory. Years later, when my oldest daughter returned from college for a weekend, I looked out the kitchen window and saw them sitting in the sand box. The sun was shining and their long, lanky legs were bent, they really didn’t fit in the box, but were seated on the edge. They weren’t giggling, they were talking very seriously while they watched sand trickle out of their hands. Again, click, Lord let me remember this moment. My daughters, still friends, still in the sandbox. Today I drove to the end of the lane to get my youngest on the school bus. With a cup of tea in hand, I sit in the car and watch her board Bus #13 every day. Our routine. I watch her greet the driver, walk back the aisle to the 4th seat on the right, she slides in and she looks out the dirty window and waves as the bus pulls away. Click. Lord, let me remember this moment. I am so thankful that I CAN tell Someone and I trust Him very much. God is an awesome listener. Today I was cleaning out that drawer in the kitchen…you know the one…nail clippers, matches, pennies, cork screw, paper clips, chalk, buttons, receipts,stamps & bits of paper. I came across a piece of paper with dates and tallies on it. A very important piece of paper. The final count was 1,220. Hmmmm….I knew what it was & I knew what it meant, but I want to keep you guessing. Those tallies could represent sleepless nights, tears, anxious moments, hugs, prayers, arguments, court appearances & good byes. Or maybe I made a hash mark for every hello, broken promise, doctor appointment, parental visit, kiss, or court delay. A tally for each book read, each butterfly kiss, each game of ring around the rosie? It actually is a count of days that included all of those. The final count was 1,220 days that my daughter spent in foster care. She had been alive approximately 2,016 days on the day we adopted her. There is something terribly wrong with a system that does this to children. However, we are no longer making tallies….she’s been ours legally for about 1,581 days and counting. Though the journey began and ended in different places than we expected, we are so blessed that we get to be her forever family. Together We Rise is an organization that frequently publishes pictures of kids & their final foster count. I wish there was a way we could all work together to make those numbers smaller. My thoughts and prayers go with all foster families who are still keeping track!